A new study of Merck MRK +0.21% & Co.'s Gardasil cervical-cancer vaccine showed it was associated with fainting on the day of inoculation and skin infections two weeks afterward, but no link with more serious health problems was found. The vaccine protects against four strains of the human papillomavirus, or HPV, two of which account for about 70% of cervical-cancer cases in women. HPV is also linked to vaginal cancer in women and mouth and throat cancer in both men and women. 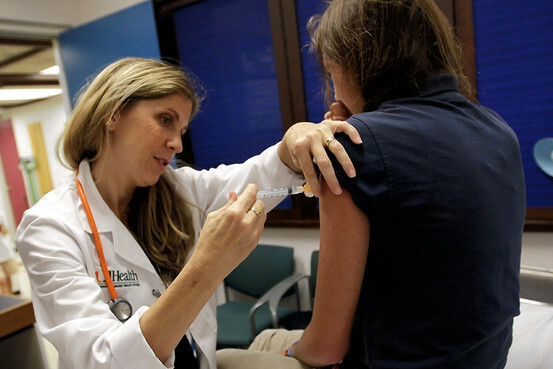 The Centers for Disease Control and Prevention estimates about 15,000 women and 7,000 men are diagnosed with an HPV-related cancer each year in the U.S.
A 13-year-old girl receives an HPV vaccination at the Miller School of Medicine in Miami. Fainting and skin problems such as redness and swelling at the injection site are known side effects of the vaccine. Doctors are instructed to have patients sit or lie down for 15 minutes after getting the shot. The Gardasil study—led by the Kaiser Permanente Vaccine Study Center in Oakland, Calif.—was required by the U.S. Food and Drug Administration and the European Medicines Agency to provide an additional look at the vaccine's safety in a large group of people. It was funded by Merck. Gardasil was first approved in 2006 for girls and women ages 9 to 26 years old before later being approved for use in males. GlaxoSmithKline PLC also sells an HPV vaccine, Cervarix, in the U.S. which was approved for use in females in 2009. Federal guidelines recommend that girls and boys ages 11 to 12 receive the HPV vaccine in a three-dose series before they are sexually active, and it coincides with recommendations on other vaccines given to that age group. However, immunization rates lag that of other vaccines such as ones that protect against meningitis, partly because of concerns about the vaccine's safety, doctors say. The most recent CDC figures showed that 53% of girls ages 13 to 17 had received at least one dose of the HPV vaccine in 2011 but only 35% had completed the three-dose series, which are supposed to be given over six months. The research published Monday in the Archives of Pediatrics & Adolescent Medicine involved about 190,000 females who were part of Kaiser Permanente's health system. They received at least one dose of the HPV vaccine between August 2006 and March 2008. About 44,000 women received all three doses of the vaccine. Researchers, led by Nicola Klein, the co-director of Kaiser's vaccine-study center, looked for emergency-room visits and hospitalizations for 60 days following each dose of the vaccine and then reviewed the records to see if there might be a link to it. More than 200 categories of illnesses such as asthma, diabetes, nervous-system disorders and medical conditions such as attention deficit disorder, back pain and other injuries were reviewed. In most cases the condition existed before the vaccine was given. There were 14 deaths recorded among girls and women in the study but the causes, including car accidents, congenital heart problems, suicide, lupus and pneumonia, weren't linked to the vaccine. Dr. Klein said that an independent group of doctors also reviewed any medical records in the study involving deaths and certain other conditions such as autoimmune diseases. Data from the same group of women published earlier this year found no increased risk of lupus, rheumatoid arthritis, multiple sclerosis or Type 1 diabetes, which are all considered autoimmune diseases. "This is very reassuring," said Mary Anne Jackson, section chief, infectious disease at Children's Mercy Hospitals and Clinics in Kansas City, Mo. The "bottom line is it's a very safe vaccine," added Dr. Jackson, who wasn't involved in the current study, but is involved in a separate, continuing, federally funded study of Gardasil looking at the vaccine's effectiveness in girls who receive the second or third dose much later than recommended.